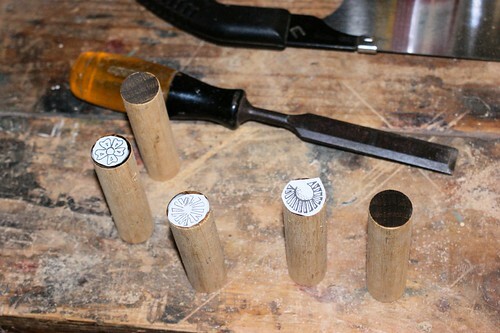 I’ve talked about how easy it is to make wooden stamps a few times in the past. Here, here and here come to mind. I’m making some archer’s bracers based on Mary Rose originals to sell through Sven the Merchant and thought I’d take the opportunity to demonstrate a couple of techniques I use. As before, the base for the stamp is tassie oak dowel, I like using this one because it is hard, has very fine end grain and can be easily heat hardened. For most of the stamps, I created the stamp outlines on my PC at full size, reversed the original design and then printed them. 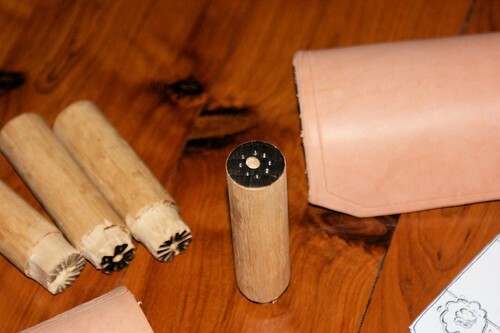 After that I cut out the designs and glued them to the ends of the dowels. From left to right, stamps for Mary Rose 81A1185, 81A4639, 80A0901 and one marked up for 81A5826. I’ll cover that technique next. 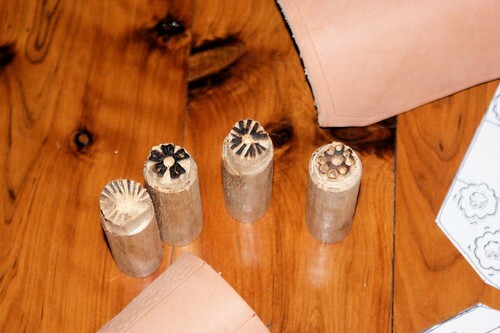 Remove everything that isn’t stamp with saw, knife, chisel and/or drill, case the leather and start stamping to taste. The second method is for the simpler stamp used on 81A5826, it needed a 3/8″ hole in the middle, surrounded with 1/8″ holes. I just marked up the centre and at 45° intervals and applied a centre punch and power drill. The centre hole went a bit wonky, so I turned the dowel over and did it again on the other end. 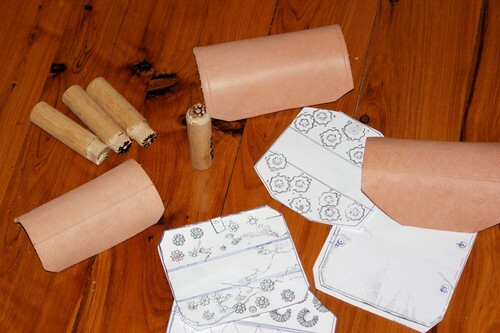 Stamps, bracers and templates everywhere. Just straps and buckles to go. If you have Weapons of Warre, have a look at the section on bracers by Hugh Soar in Volume 2. You’ll see some finished ones here soon.